BA strikes banned again - defend the right to strike! Pass this motion! Greece: "We need united working-class action across the continent"
My life at work: social work - overspent or underfunded? CWU Conference: are we ready? 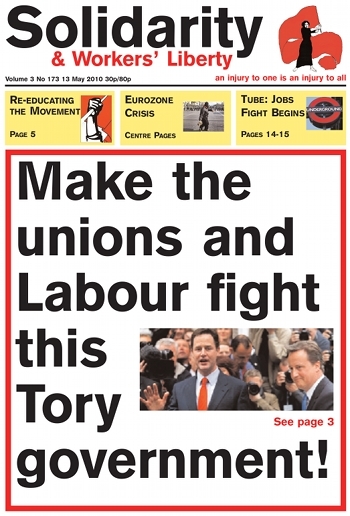 Make unions and Labour fight this Tory government! Eurozone crisis: for a workers' Europe! An interview with Stavros, a militant in the Trotskyist Organisation of Communist Internationalists of Greece (OKDE). Amanda McKenzie works as a social worker in London. I’m a social worker for an inner-city London borough. I currently work in a team working with adults with learning disabilities. My specific job involves working with people with learning disabilities who also have mental health problems, and I also work with learning-disabled parents. A lot of the services related to this type of work, such as care home provision, have been privatised but my work is still directly run by the local council. On Sunday May 9, Farzad Kamangar, a teacher trade union activist from the Kurdish region of Iran, who has been the subject of an international solidarity campaign, was executed. Four other political prisoners were executed at the same time. The executions took place without families and lawyers being informed. By such an outrageous “out of the blue” state killing of a high profile political prisoner, the clerical-fascist regime attempted to terrorise the labour and opposition movements in Iran. Christian belief in Jesus relies on the idea that Jesus existed and he was a very special man. That he worked miracles — e.g. whether he cured the sick. That he was the son of God, born to a virgin. If Jesus was not as unique as Christianity tells us he was, then Christianity loses its reason-to-be. Philip Pullman’s retelling of the Jesus story shows, hypothetically, how the all-important miracles in the Bible could have been invented. Pullman creates situations to “explain” how the events in Jesus’s life could have happened. Luca Guadagnino’s I Am Love defies expectations. British ice-queen Tilda Swinton shows unprecedented emotional range as Emma Recchi, a working-class Russian woman, married to an Italian entrepreneur. Barry Finger, a member of the editorial board of the US socialist magazine New Politics, looks at the political life of Phyllis Jacobson, who co-founded and for a long period edited the magazine. Phyllis Jacobson, who died after a protracted illness on 2 March, just shy of her 88th birthday, was the dynamic force behind a remarkable political and intellectual partnership of shared passion that left an indelible imprint on three generations of twentieth century American radicalism. In February, London Underground announced 800 front-line stations staff job cuts: 450 ticket sellers, around 200 station assistants, and a handful of managers. Facing a slick campaign from London Underground, RMT activists are campaigning hard, and are now waiting for a fighting response from the top of the union. On May 5 the biggest workers' demonstration since 1976 took place in Athens. All the avenues of the city center were flooded by hundreds of thousands of workers who were protesting against the IMF-EU-Greek government austerity plan. It is impossible to make an accurate calculation of the crowd's number. There are estimations which start from 150,000 and end up to 500,000 people. No matter the exact number of the protesters, there is no doubt that this was an unbelievable show of of the working people's force.